With its warm climate and family-friendly atmosphere, Myrtle Beach attracts millions of visitors each year. The extensive beaches offer an it’s-always-summer “home” to many families, a getaway on the Grand Strand. Broadway at the Beach is packed to the brim with entertainment. Here you can play to your vacationing heart’s content—there are shows to watch, miniature golf to play, and candy shops to conquer. In the summertime, there’s a great display of fireworks that are apt to punctuate a perfect June or July night. If you’re interested in shopping, The Market Common is the place to go. The open-air mall also includes a slew of restaurants and a top-of-the-line movie theater. Stroll through and gawk at the oceanfront condos for sale; the Market Common’s got those, too. 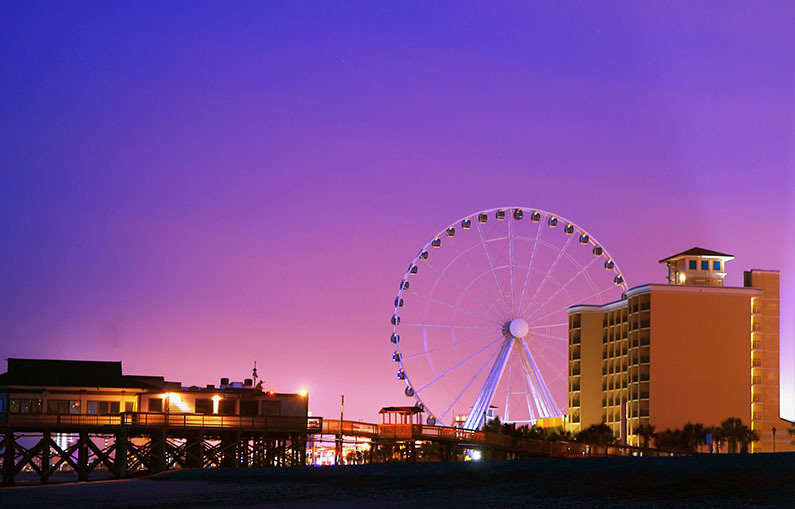 The Myrtle Beach Sky Wheel is a more recent contribution to the cavalcade of attractions in Myrtle Beach. At 212 feet, it is one of the tallest Ferris Wheels in the United States, and has become a beloved part of the beach town. Take a relaxing ride and take in the fantastic view—life is just better at the beach. Rainy day at the beach? Consider a trip to the Franklin G. Burroughs – Simeon B. Chapin Art Museum, where gorgeous collections of Southern art are on display. Beyond its exhibits, the museum also hosts classes and events year-round, and boasts a reception room with a baby grand piano. Wrapped around the front of the building is the enclosed “Tea Porch,” which lends visitors an incredible Atlantic Ocean view. To plan your trip to Myrtle Beach or for an extended guide of things to do, visit the official Myrtle Beach city guide at http://www.visitmyrtlebeach.com.